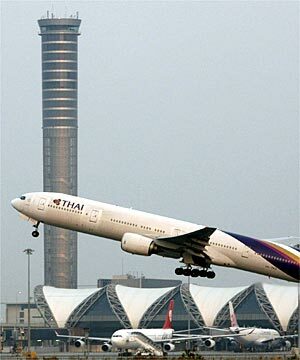 Six months since the opening of Bangkok's $US4 billion Suvarnabhumi Airport, complaints continue about corruption, cracked runways, poor planning and a shortage of toilets, particularly in light of a 15 percent rise in landing and parking fees effective April 1, making the airport more expensive for airlines than rival facilities in Singapore and Kuala Lumpur. "Airlines are not getting value for money for what they are paying at Suvarnabhumi," said Albert Tjoeng, spokesman for International Air Transport Association. "The increased charges are unreasonable, especially given the operational deficiencies at the airport." Many travelers also complain about so-called taxi "mafias" and their touts who pounce on bleary-eyed passengers in the cramped arrivals hall. "I don't think there is a set rate. They just do whatever they want to do," said Robin Tonsaker, a Canadian tourist. Airport officials claim they are working with the police to root out the mafia.